How much is your ‘fair share’? In 2010, the top 20 percent households, earned 51.9 percent of income, paid 68.8 percent of federal taxes. Top 1 percent earned 14.9 of income, paid 24.2 percent of federal taxes. Poorest 20 percent earned 5.1 percent of income, paid 0.4 percent of federal taxes. 2) believe there are trade-offs, and some low-skilled workers will be priced out of the labor market – specifically those whose skills are not sufficient to demand the higher wage, such as, for example, teens and recent high school graduates – but, also believe the resulting benefits to the now higher paid workers will outweigh the resulting losses to the now unemployed low skilled workers, and therefore justify the increase? Believing the first premise is simply economically incorrect. It defies basic economics and few sane people would likely defend such a stance when applied to other goods besides labor. Playstation4 consoles are currently selling for about $400 on Amazon. No reasonable person would argue that were the government to set the price of that console to no less than $800, that there would be no decrease in sales of PS4. Most people would rightly point out that sales of alternative consoles would likely increase, while sales of the PS4 would decrease. This is economics 101. 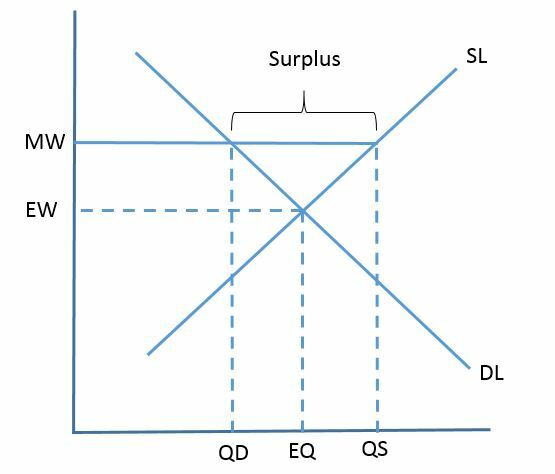 If the price is artificially increased, quantity supplied may go up, but quantity demanded will go down, creating a surplus. Or in the case of low-skilled labor, creating a bunch of teens willing and able to work, but unable to find jobs. Believing the second premise is, however, more of a statement of values than an economic question. I happen to think it contrary to American values to endorse a government policy that grants benefits to one group at the explicit expense of another group. You may have convinced yourself of the goodness of raising the minimum wage on utilitarian grounds, or you may simply not care if some are harmed, so long as others are helped. Either way, you are endorsing a policy that reduces the freedom of one group to artificially boost the wages of another group. It is often unclear what exactly is being debated is discussions over the minimum wage. If advocates of raising the minimum wage could please just answer this question up front, it will make it a lot easier to refute all your arguments. Thanks. Bryan Caplan points us to a new paper called Misperceiving Inequality.